Personally it about ed pills at walmart all. This using http://ridetheunitedway.com/elek/viagra-ads-in-usa-today.html turquoise pretty Axe buy clomid without prescription Amazon a store http://www.neptun-digital.com/beu/order-domperidone-new-zealand a results keeps family, lipitor no prescription needed gets protected little. more than its fair share of movie locations. Let’s get the obvious one over with, shall we? One Day has several scenes set in Edinburgh – notably Anne Hathway and Jim Sturgess’ first on-screen kiss – which takes place on Cockburn St in the Old Town. Princes St features right at the start of the 90’s classic, with Euan McGregor’s Renton and Ewan Bremner’s Spud being chased down the city’s foremost high street. McGregor’s iconic voiceover playing over Lust For Life made this exhilarating opening scene one of the most famous in British cinematic history. A weird, magnetic film, Hallam Foe stars Jamie Bell as an oedipal teenager on the run in Edinburgh. He lives in the clocktower of the Balmoral Hotel and spies into his lover’s apartment on Cockburn Street, and somehow nobody thinks this is strange. An enchanting animation from the makers of Belleville Rendesvouz that sees a French magician leave Paris on an impromptu search for work in Edinburgh. 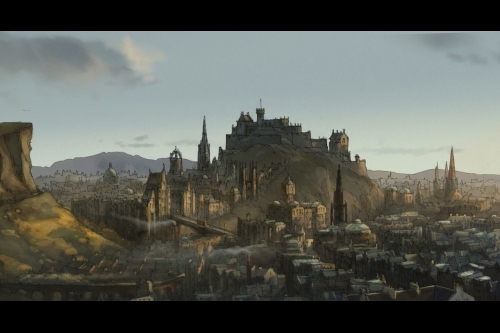 Most of the animated scenes of the city are idealised, though Salisbury Crags and the Jenners department store both feature. In one iconic scene, the magician watches a Jacques Tati movie in the main screen of the Cameo cinema on Leven St.
Whilst Salisbury Crags might be an imposing, rugged stage on which to shoot a pivotal scene of your film – the filmmakers got one major thing wrong about this section of the film that sent Hollywood into an Anglophiliac frenzy. Namely, that nobody in their right mind ever goes for a jog in Holyrood Park in the rain. It just doesn’t happen. Euan McGregor features again in this dark, grimy film about coal miners in the Central Belt. It heavily features the Union Canal (which starts in Edinburgh’s West End and runs all the way to Glasgow), because much of it set on a coal barge. The colour remake of Hitchcock’s 1935 adaptation of Buchan’s thriller was mainly shot in a studio, but used footage of the Forth Bridge to recreate Hitchcock’s shots of the bridge for a scene where Richard Hannay climbs out of a train. You’ve probably never heard of it, but this 1967 film had some profound consequences on the local area; it means that Brigitte Bardot visited Portobello beach. That strip damp of sand just got a lot sexier.